1. The athletic competition will run under the rules of the North American Scottish Games Athletics (NASGA). 2. All competitors, except first-time Novice, must wear kilt and long hose while competing to be eligible for Training Scholarships (Awards). 3. The Amateur A is one who, in the past two (2) years, has personal records exceeding four (4) or more of the following marks: Caber-turned 100 lb. x 17 ft.
a. 17 lb. stone throw - 40 ft.
b. 28 lb. weight for distance - 50 ft.
c. 56 lb. weight for distance - 25 ft.
d. 16 lb. Scottish hammer - 90 ft.
e. 22 lb. Scottish hammer - 75 ft.
f. 56 lb. weight for height - 12 ft.
a. Caber-turned 80 lb. x 16 ft.
b. 17 lb. stone throw - 30 ft.
c. 28 lb. weight for distance - 40 ft.
e. 16 lb. Scottish hammer - 75 ft.
f. 22 lb. Scottish hammer - 60 ft.
6. Amateur Lightweight is an amateur class in which all throwers’ weight is 199 lb. or less. 7. 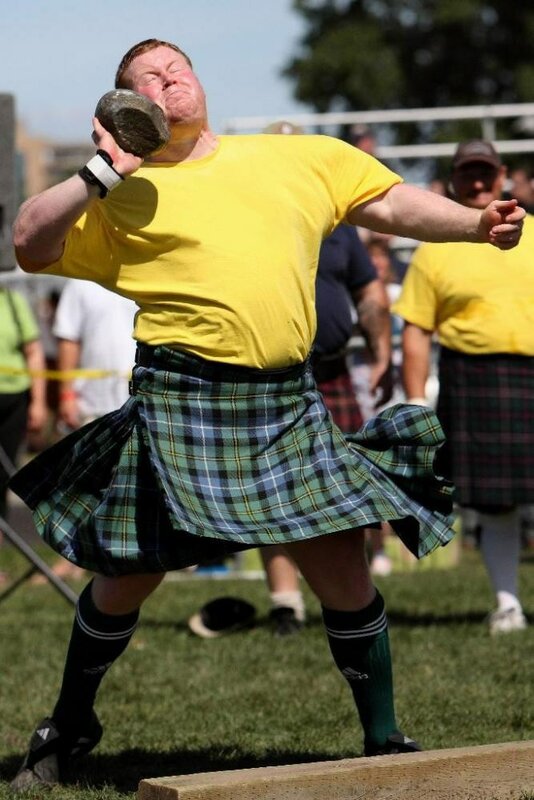 A Masters competitor is an amateur who is over forty (40) years old by the date of the Spokane Highland Games. This class includes both Junior Masters and Masters competitors. 8. 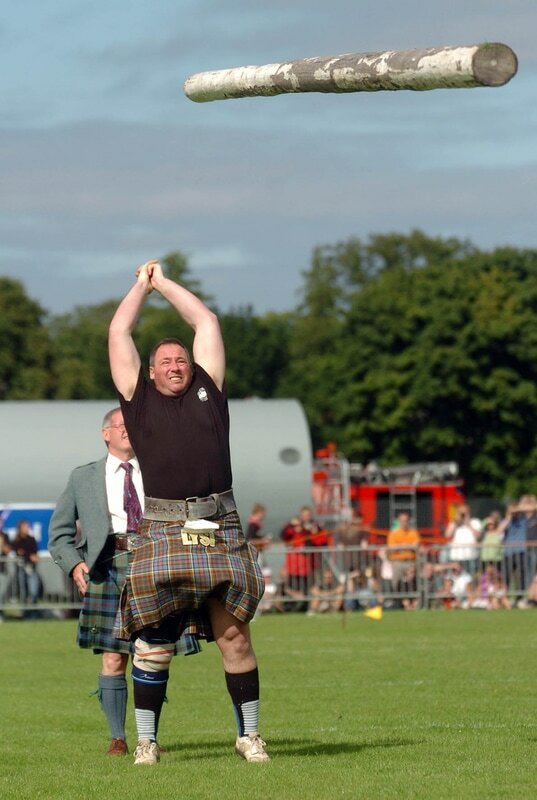 A Senior Masters competitor is an amateur who is over sixty (60) years old by the date of the Spokane Highland Games. 9. A Novice competitor is an amateur whose personal records do not exceed at least four (4) of the above marks. 10. The organizers and judges reserve the right to disqualify any entrant if it is felt that harm may come to the entrant, but are not liable for doing so. 12. All athletes must check in by 8:00 a.m. The athletes will have a meeting with the judges at 8:30 a.m.
13. Competition will begin at 9:00 a.m. Competitors must be on hand when called, or forfeit their entry. It is the responsibility of the competitor to stay aware of the progress of the events. 14. In the event of a tie in overall points, the number of events won will determine the class champion. Ties not broken by this method will be resolved using the results of the Caber Toss. 15. It is the responsibility of the competitor to pick up all awards at the Highland Games, or request them in writing by September 30 following the date of competition. Failure to do so will result in forfeiture of awards. Medals will be awarded to the top three (3) competitors in each event for each class or category (Amateur A, Amateur B, Amateur C, Amateur Lightweight, Masters, Senior Masters, Novice, Women's and Women’s Masters). There must be a minimum of four (4) competitors per class for awards to be given in that class.